The first of the three visitors of Job (Job ii. 11), surnamed "the Temanite"; supposed to have come from Teman, an important city of Edom (Amos i. 12; Obad. 9; Jer. xlix. 20). 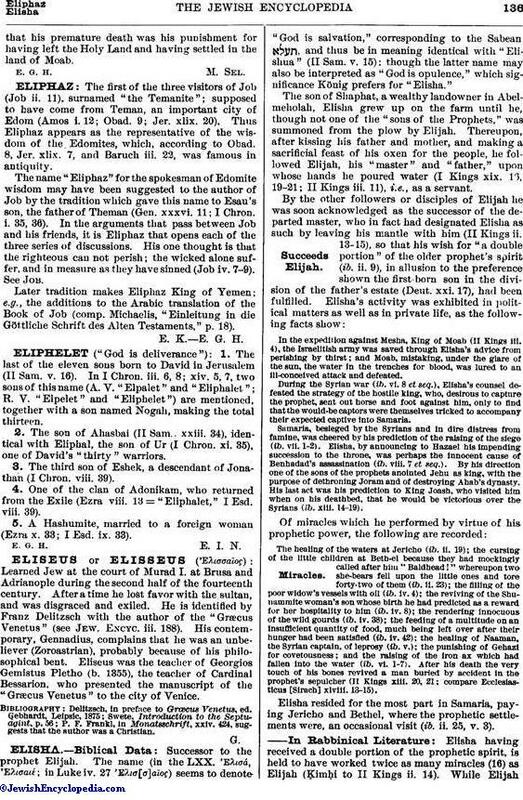 Thus Eliphaz appears as the representative of the wisdom of the Edomites, which, according to Obad. 8, Jer. xlix. 7, and Baruch iii. 22, was famous in antiquity. The name Eliphaz "for the spokesman of Edomite wisdom may have been suggested to the author of Job by the tradition which gave this name to Esau's son, the father of Theman (Gen. xxxvi. 11; I Chron. i. 35, 36). In the arguments that pass between Job and his friends, it is Eliphaz that opens each of the three series of discussions. His one thought is that the righteous can not perish; the wicked alone suffer, and in measure as they have sinned (Job iv. 7-9). See Job. Later tradition makes Eliphaz King of Yemen; e.g., the additions to the Arabic translation of the Book of Job (comp. Michaelis, "Einleitung in die Göottliche Schrift des Alten Testaments," p. 18).